And so it has been for my sisters and me, much as it was for that early church at Ephesus and those early disciples who yearned to follow Jesus’ teachings and guidance, but weren’t sure if they were able or how to go about it. And they had to travel some very bumpy roads that took them in very disparate directions. Still, across the miles of bumpy roads and different journeys, they were connected in this sense of purpose and call from the very beginning. At the end of Luke’s Gospel, the Risen Christ re-appears to the disciples one more time, re-teaching them everything he had been teaching them for three years, and then blessing them so that they could become a blessing to others. After they received this blessing, they returned to Jerusalem with great joy, to await their call and clarity about how to begin fulfilling their purpose – which we’ll get to next week when we celebrate Pentecost Sunday and the miraculous gift they received from God’s Holy Spirit. But for this week, we’re focused on that sense of call that is already connecting them as they await the Spirit. Just as that sense of call connected my sisters and me, not only to one another, but to grandmothers who prayed for us and a mother who instilled in us a deep sense that we had purpose in this world that needed to be fulfilled so we could bless others as we had been blessed. I’ve often thought that my grandmothers’ and mother’s prayers were much like that we read of in this early section of the letter to the Ephesians. I can almost hear my mother and grandmother saying words like these: “I have heard of your faith in Christ Jesus and your love for others. I remember you in my prayers always, and I pray that God will give you wisdom to open your eyes and hope to trust in God’s promises.” My grandmother hardly knew me, and yet she prayed for me. Paul hardly knew the Ephesians, and yet he prayed for them. It was an unexpected arrival, coming late in my grandmother’s life, when she was too old to travel and my mom was too busy as a single parent (raising three girls) to get us to Grandma’s house, some six hours away. What I didn’t know, but somehow felt anyway, was that Grandmother’s prayers were connecting with me across the miles, praying for me simply because she’d hear my mom tell stories of me and my shy little smile and my loving little heart that already felt a call to brighten my little corner of the world, when I was just a tiny child. From early years, I had a strong sense of call, connecting me in ways I could not yet name to my sisters, our mother and her mother before us. Even before I could define it or name it, God’s call was present and God’s Spirit was trying to guide my steps toward answering that call, connecting me with every person who was praying for me, whether I knew them or not. As Christians, we are all connected in call – whether we recognize it or not. There are people praying for each of us and for our church, people whom we have never met. I know this because I’ve already encountered a few Corona del Mar neighbors who tell me about how much they value this little church. I’ve met guests who don’t attend here regularly who’ve told me how much this church means to them and how often they pray for us. Before I even heard a whiff of a rumor that your church was about to lose a beloved pastor, I had a phone call from a friend and colleague who is not a part of this church. He called with a prayerful cry, “That little church in Corona del Mar you love so much is in trouble. You’d better call them. I think they need you!” He had heard of your love of the saints and your faith in Christ Jesus. He didn’t know you, but he was praying fervently that you might sense God’s wisdom guiding you and trust in God’s promises, even when you were going through a troubled time. Why would a pastor who does not know this church or its people be praying for you? Because he felt a connection based on his call, a call to strengthen churches for the work of Christ. As Christians, we are all connected together in call, just as those first disciples were – not because we are called to the same purpose or plan, but because we are all called by God. We are all called to sense Christ’s wisdom. We are all called to trust God’s promises. We are all called to move forward in the unique purpose for which we were created. That unique purpose differs for each and every one of us. Here at Community Church, we have often referred to that sense of purpose or calling as “vocatio.” But that’s just a fancy old Latin word to describe a timeless calling that every child of God receives. We are all sent into this world for a purpose, with a specific calling or a series of calls for different seasons of life, if only we have the wisdom and faith to listen and respond. Vocatio – we all have one. We are all sent to live into this purpose or vocatio, not to go it alone, but to do our part – however small or large – so that together, connected in call, we can fulfill God’s purposes in the world. When those early disciples immersed themselves in that wisdom, they discovered that they could finally understand more of those mysterious lessons Jesus had been trying to teach them. When they rested in the promise that Christ’s Spirit would come and support and guide them with the next steps to move forward and continue Christ’s work, they indeed did receive the Spirit and discover their purpose and call. But it all began with that sense of connection. No one disciple would have to go it alone, even though each disciple would be called to serve a little differently. No one disciple would be responsible to build the church, although each person would have a role to play. Connected together, they would be able to serve the world with the same type of power and purpose that Jesus had displayed. Because connected together, they were the Body of Christ. Connected together, we are the Body of Christ. Connected together, we – like those first disciples – can discover our unique gifts and purpose to embrace the Spirit’s power and live into our individual purposes. Just like my sisters and I have done, we can all live into God’s purpose and make the world a little bit better. My eldest sister, first trained as a chemist thinking she would spend her life as a research scientist, discovered, with the birth of her first two children, her true call to parent and care for others – raising 7 beautiful children who came into her life, 4 through birth and 3 through adoption. My sister Rebecca, having worked in many different fields, has lived a call to a life of generosity. Providing for stepchildren whose mother was unable to care for them, my sister worked long hours with her husband to put a roof over their heads and food on their table, all the while establishing scholarships at her local high school for other kids in need, and eventually now dedicating her final working years to a university foundation to strengthen that university’s financial ability to provide phenomenal, affordable education for its students. And then me, the shy little girl with the big heart, finding her voice at about age 10 with her first sermon leading to many more sermons and eventually a call to preach the Gospel and serve the church as pastor and leader. Each of us sisters with a very different calling, a unique purpose, and a God-given vocatio to fulfill, in very different ways from very different corners of this country – but still connected across the miles and across the years because of Christ’s call in our lives. We are connected at Community Church – just as the church at Ephesus and the first disciples awaiting the Holy Spirit were connected because for Christ’s call connects us. 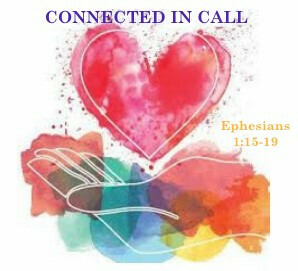 We are connected in call, for Christ call to each of us: “Follow me.” Whether you are listening on-line, watching a recorded sermon, praying for our church from afar, or sitting in the pew today, we are connected. We are connected in call. With faith in this promise, may we gather together in one room next week for Pentecost, as that early church did, to await the Spirit’s movement and guidance. Let’s all join in worship right here in Corona del Mar next week to celebrate Pentecost, and see what the Spirit gifts to us. And if we can’t gather in body, let’s gather in Spirit from our many different places, so that we sense our connection in Christ’s call. And let’s pray for one another not just next week -- but always -- without ceasing, giving thanks for the love we have for one another and for the saints; let’s pray for our mothers in the Spirit, and all the role models who have enriched our lives by loving and parenting and guiding us well. Let’s pray for one another always, without ceasing, that we might know God’s wisdom. Let’s pray for one another always, without ceasing, that we might know the hope to which we are called, trusting in God’s promises. Let’s pray for one another always, without ceasing, that we might experience that beautiful sense of connection that I feel with my sisters, my mother, and my grandmothers – not because we see each other very often or know each other all that well, but because we are connected in call, a call and a purpose that connected us through the power of my grandmothers’ prayers before we were even born. Let’s pray together, with and for one another always, that we might know that same sense of connection in this church – no matter how often we see each other or how well we know each other, because God’s Spirit is powerful enough to connect us in call through this powerful gift of prayer. Let’s pray together, with and for one another always and for all upon this earth, that we might sense the Spirit’s clarity -- calling us forth to serve in our unique and purpose-filled ways and empowering us to answer that call with confidence and faithfulness all of the days of our lives. Amen.